Photos of Shop Vallejo First Giveaway! Hooray... Zoey June kicked off their ShopVallejoFirst giveaway! Their winner was Debbie Morgan Mustico, Vallejo. 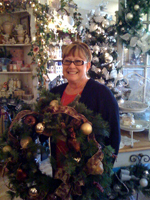 She is shown here with the wreath and gifts she came into purchase and then received a gift certificate. They had set the goal of the first $100 customer and she happened to be the very first customer. She was preparing for a dinner party and ran in to get last minute needs. Seemed to be the perfect example of the conveniece of SVF! Joseph Castor, a Vallejo Firefighter, is the recipient of a $75.00 gift certificate from DeMares Jewelers. Danielle Littleton from Vallejo received a free “Ultimate full service car wash and an Express Detail service” from Jack Anthony's 7 Flags Car Wash.
Herver Marquez came into the Harley Shop on Tuesday morning at around 11:00am and was the winner of our Holiday Shop Vallejo First Gift Basket. He was in the market for a new baseball cap, shown wearing it in the photo, and left with a Gift basket well worth over $100.00. Mary Ann from Vallejo received a free “Ultimate full service car wash and an Express Detail service” from Jack Anthony's 7 Flags Car Wash.